Officer Kathrin Sure of the Herzberg/Elster, Germany Police Department spent three months in Dixon, Illinois earlier this year. The two cities began their Sister City relationship in 1999 when Herzberg Mayor Michael Oecknigk reached out to his contacts in the United States. Annually, the two cities send delegations to each other during which members reside in home stays. They will celebrate their 20th sister-city anniversary this upcoming year. Mayor Oecknigk first suggested this professional exchange to Officer Sure and to the city of Dixon in 2017. They spent a year making contact with law enforcement, finding and furnishing a suitable residence, solving telephone communications with Officer Sure’s hometown and family, and deciding on a good balance between programed and free time. “I had the chance to stay in Grand Detour/Dixon, Illinois for three months. The main reason was to improve my English, but I got so much more. I got a view of American life from backstage. Having Claudia Nelson, a teacher of English Language Learners, for my English teacher was a stroke of luck. We had English lessons for two hours from Monday to Friday the whole 13 weeks I was there. We talked about everything. Claudia and David found answers for all of the questions that I had. 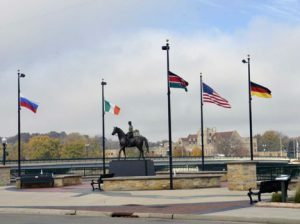 The Dixon Riverfront features their Sister Cities flags (Russia, Germany, Kenya, and Ireland) and corresponding info plaques. At the center is a statue of former President Ronald Reagan riding horseback. 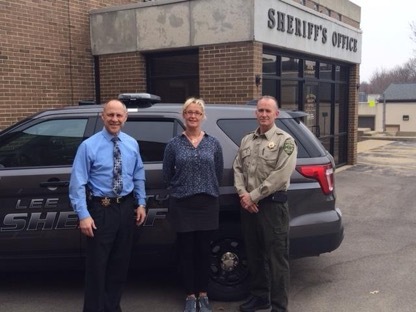 Because I am a police officer in Germany, it was especially interesting to meet police officers and have a “ride along” with them during their shifts, twice with the Dixon Police Department, and once each with a police officer from the Lee County Sheriff’s Office and the Ogle County Sheriff’s Office. It was a fantastic experience for me to see how the police work in the U.S. and to see the different technology used in their police vehicles. I was in jail once, too, but only as a guest! I often had to explain that Germany is as big as Illinois and Europe is as big as the U.S. But you can believe I laughed really loud when one person asked me if we had toilets inside our houses or whether we lived in huts. Those were crazy moments for me. Since I am a social person, I met a lot of people. All conversations were interesting and an English lesson for me. Best of all was that contact with others was uncomplicated and easy. I am thankful to the Sister Cities Association and the people of Dixon. They gave me the possibility to realize a life-long dream and improve my English, which is increasingly necessary for our local police work in these times. I’m very thankful for this. When I left Dixon, I took wonderful and interesting impressions about American people’s nature and life. I have new friends in my heart. Both cities are extremely excited about the success of this initial professional exchange and are looking forward to expanding the program in the upcoming years. No Replies to "Dixon, IL Initiates New Work Exchange With Sister City Herzberg, Germany"